There are two main types of wind turbines, vertical and horizontal. Understanding the benefits of wind turbines help you weigh the advantages of investing the world's most recognizable form of renewable energy resources. Each turbine has their advantages and disadvantages which we can explain to you during a site consultation. While there are published maps available for average wind speeds in your location, A.C.E.S has the ability to monitor on-site wind speeds. We have the skills and required resources to install a wind turbine connected to the utility grid, or independent of your local utility, making you an off grid home. 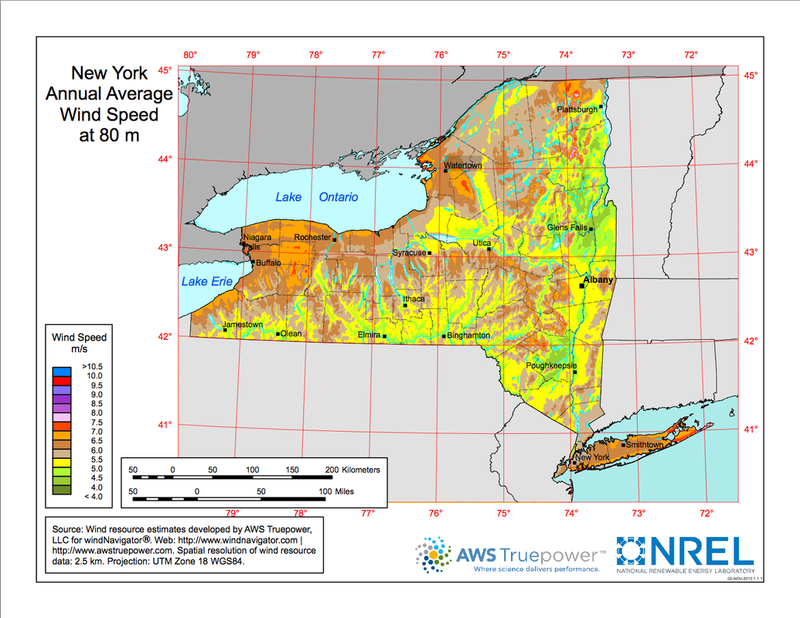 Western New York offers the geographical elements needed to take advantage of the potential of wind energy. See the below map of the New York State Annual Average Wind Speeds based on geographic area.